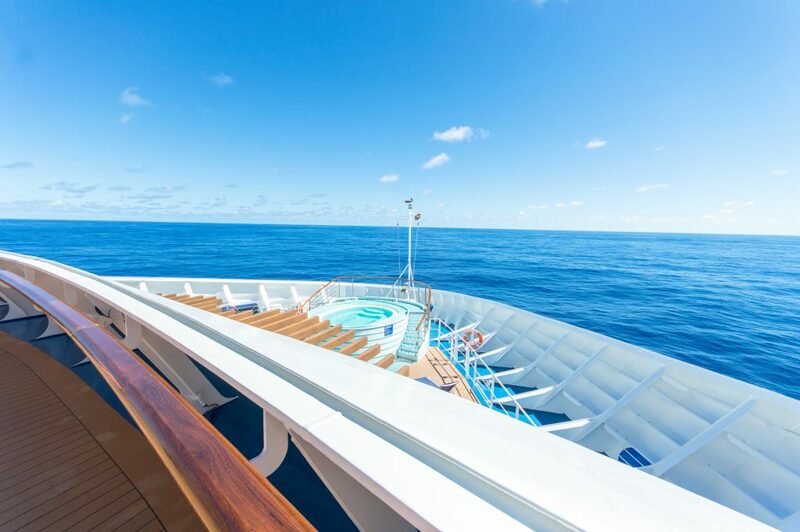 At 8 in the morning, the whirlpools open on deck 15 at the bow of the ship. 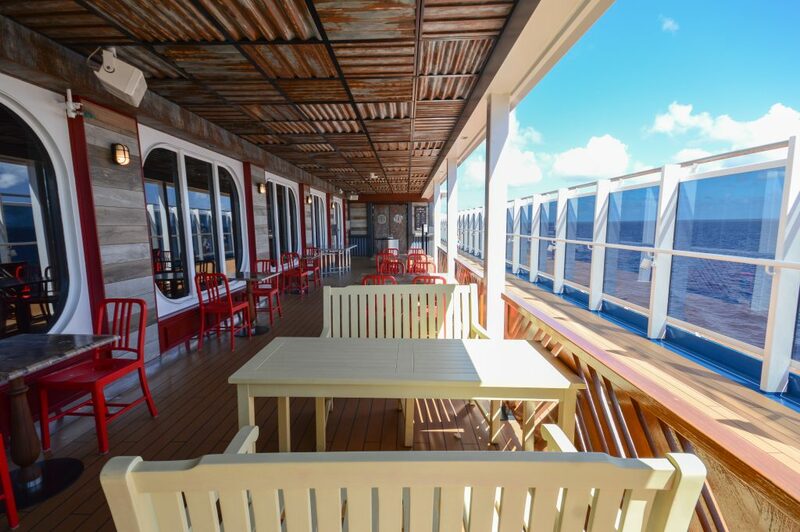 They are located on the Serenity Deck, which is only open to adults aged 21 and over. 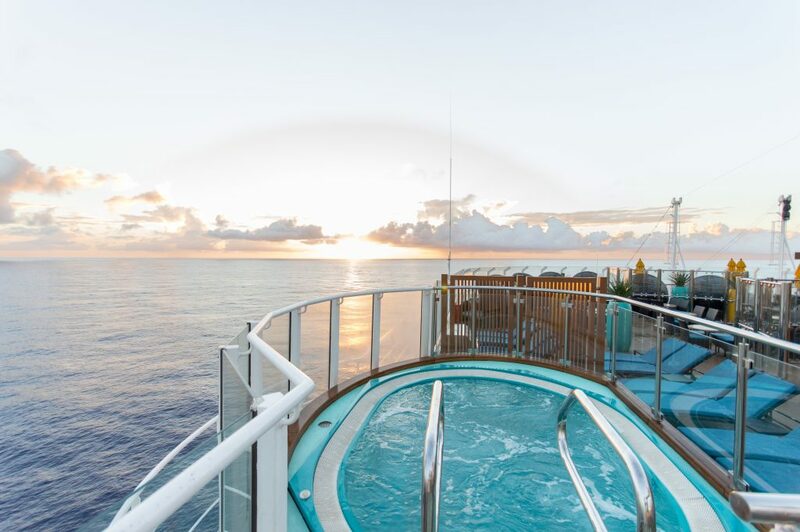 On the way to the southern Caribbean it was already over 25 degrees celsius warm and you could enjoy the first rays of sunshine in the whirlpool. 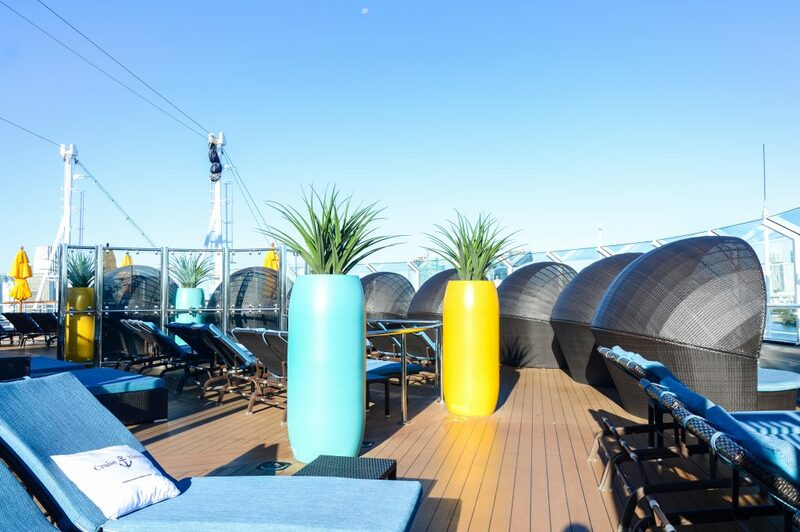 Around half past nine it gets slightly crowded on the Serenity Deck, whereas you are still completely undisturbed at 8 in the morning. 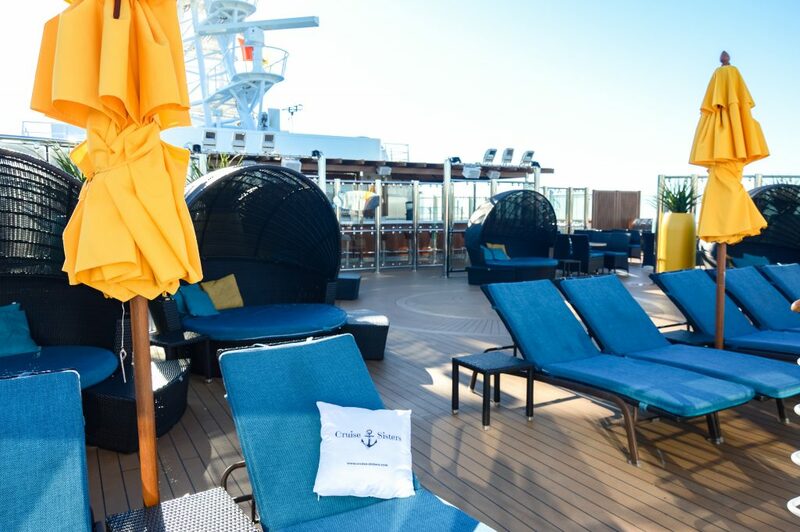 Also in the afternoon the Serenity Deck is a great place to relax. 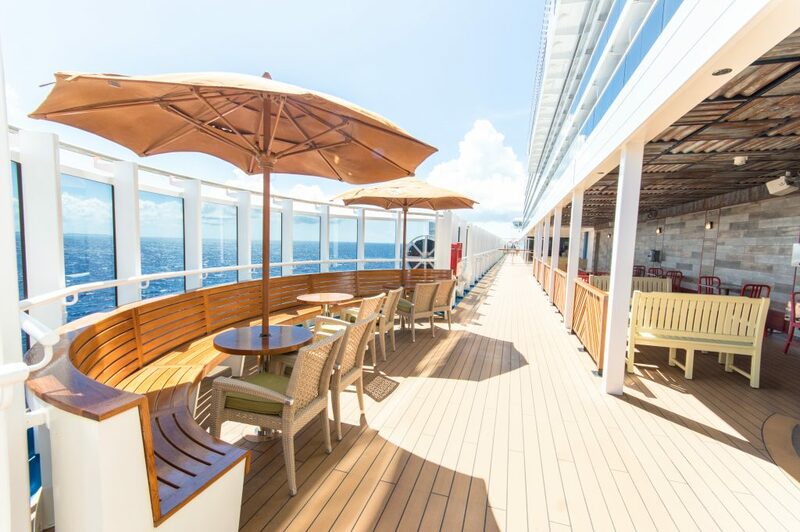 Besides deck chairs, there are also lounge islands and rattan chairs. 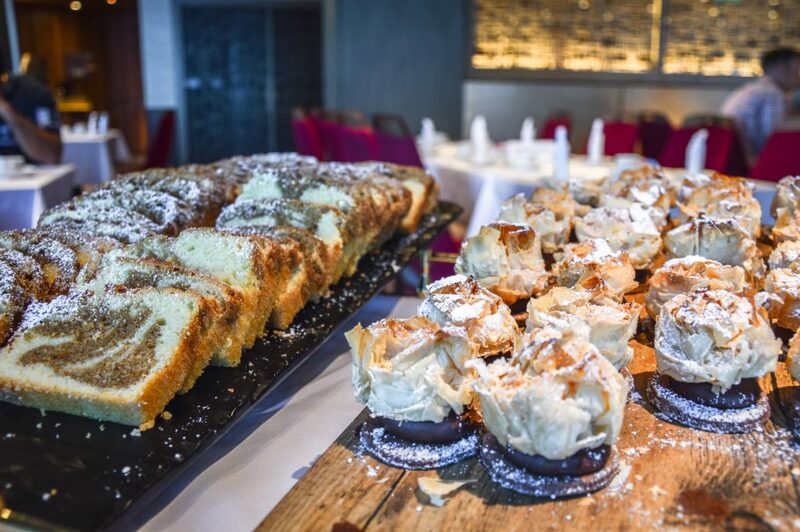 From 11 to 3 pm there is even a salad buffet with a great selection. 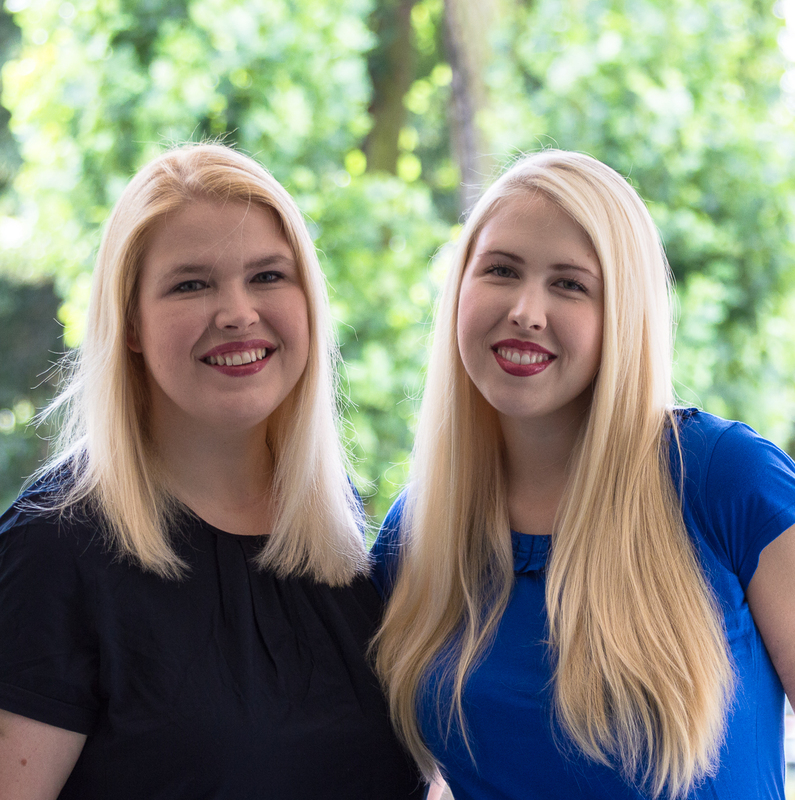 On the first day at sea they offered a free cooking demonstration in English on deck 5 at half past ten in the morning at Fahrenheit 555 Steakhouse. 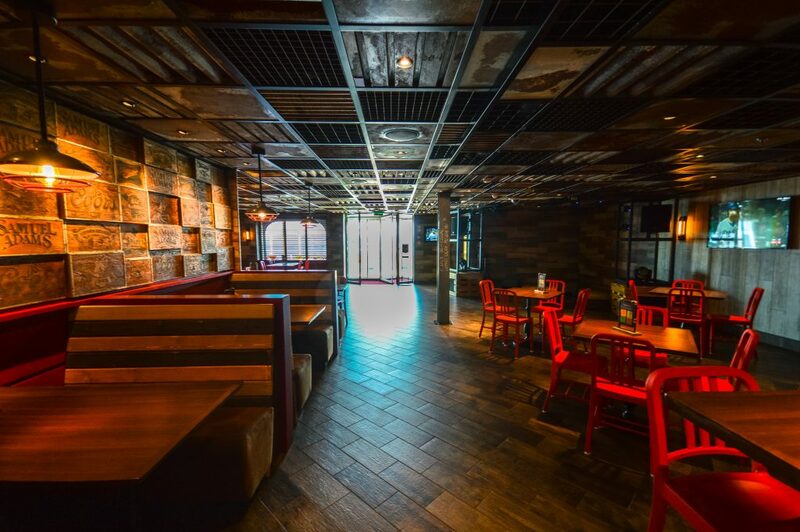 The restaurant interior was rearranged, so that the tables and chairs were set up like in a conference room facing the show kitchen. In front of the show kitchen there was a larger table where each dish was presented. To our surprise this event started with the tasting of the starter, which was already prepared in the show kitchen. Several waiters walked quickly through the rows of tables and made sure that every guest got a tasting dish. In addition, everyone got a flyer with the recipes to be able to cook the dishes at home. 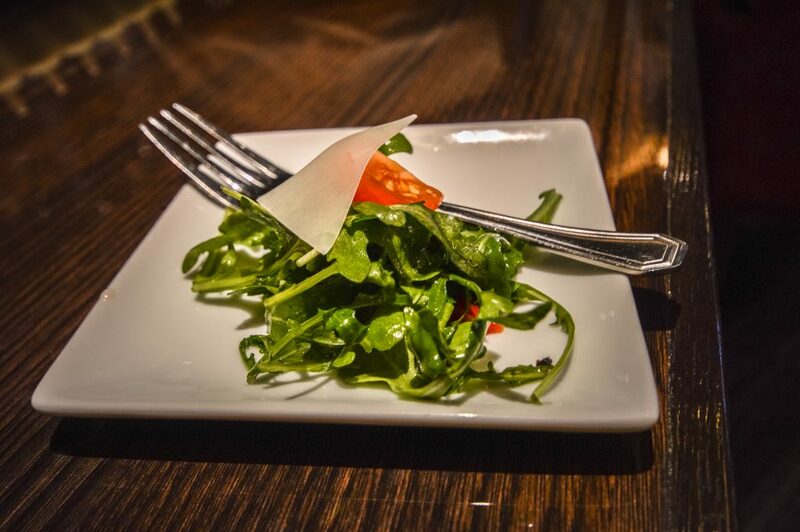 First there was a potato and beef goulash, followed by a arugula tomato salad. 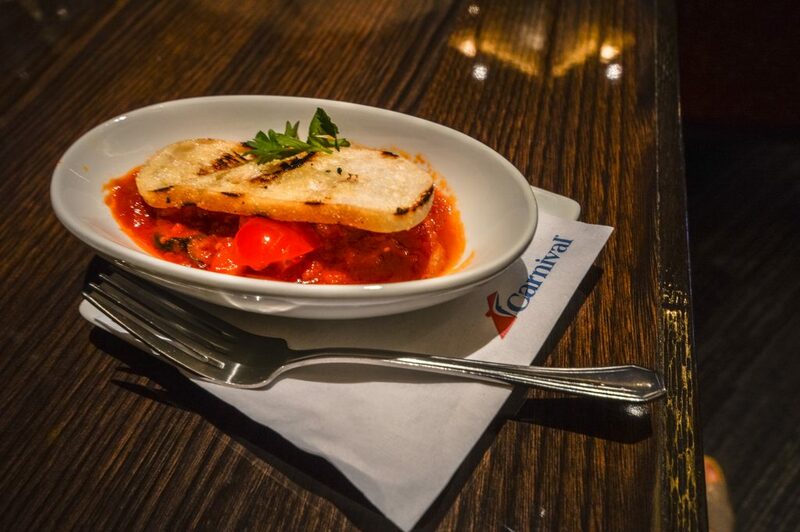 The main course was Pollo Cacciatore, an Italian dish with chicken chasseur. 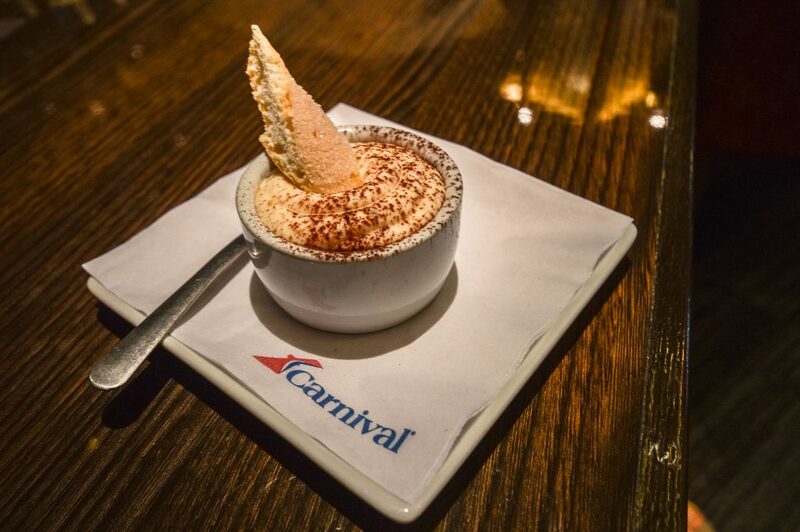 For dessert was tiramisu. The dishes were well presented and very tasty. 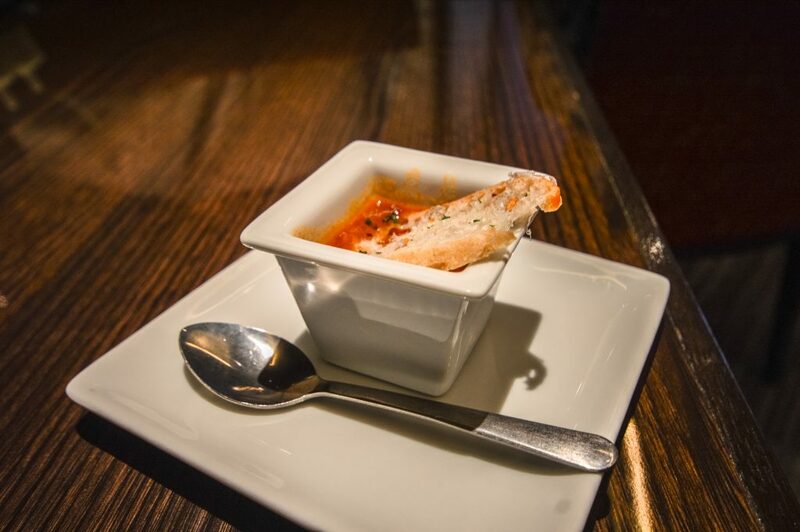 The event lasted half an hour and was very entertaining, because you could taste one dish after the other. At the end you could have a look at all the dishes presented on the table, take pictures and ask questions. 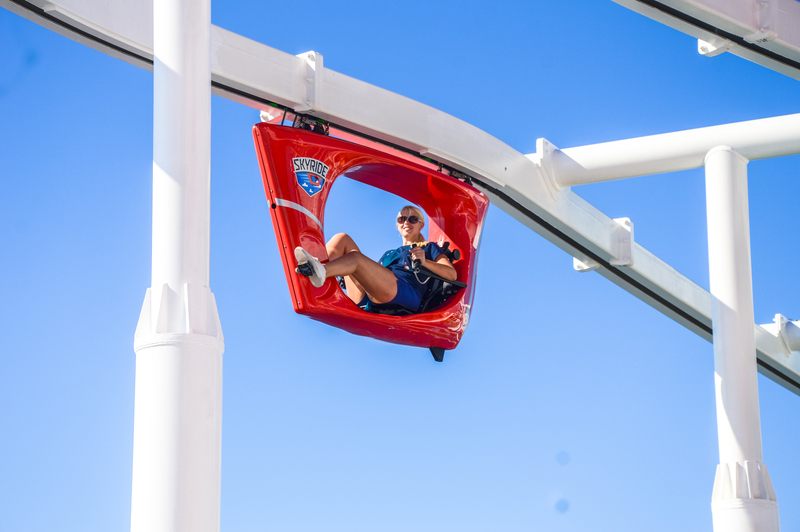 On the outside deck on deck 14 is the free Sky Ride, two vehicles suspended from a rail track, which you can use to cruise above the cruise ship at lofty heights. You pedal with your own power and thus determine the speed of the vehicle. 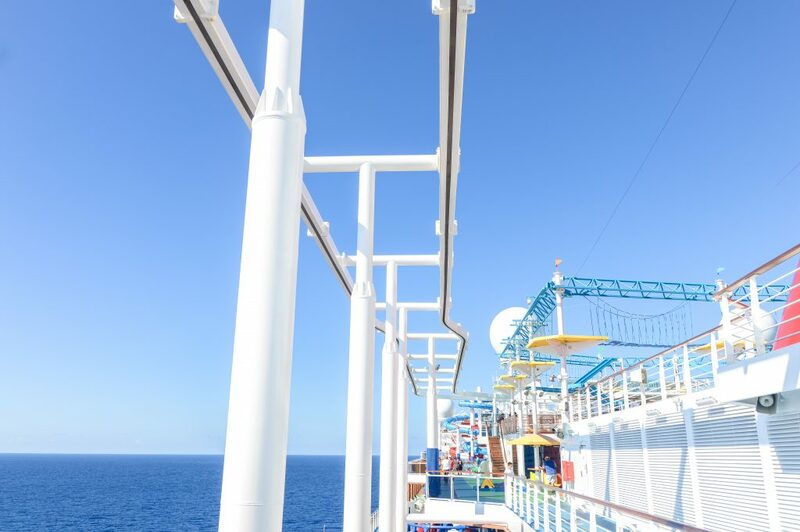 During the voyage, one enjoys a unique view over the sea. You can either set your own pace in a completely relaxed way or you can have a small race with the person next to you. Sometimes you only had to queue for 5 minutes. 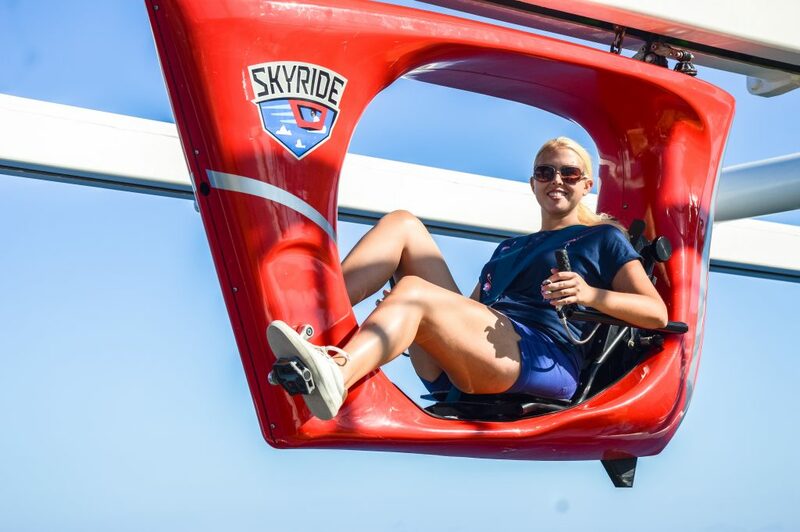 In the first few minutes the sky ride feels a bit freaky and it was quite exciting, because you are so high in the air above the sea. 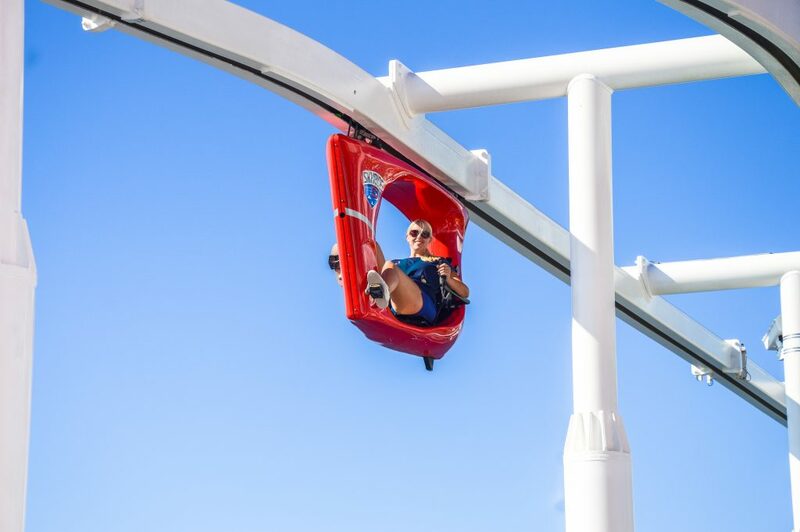 But one quickly gets used to the ride through the air and it is a lot of fun. After the first lap we started again for a second lap. 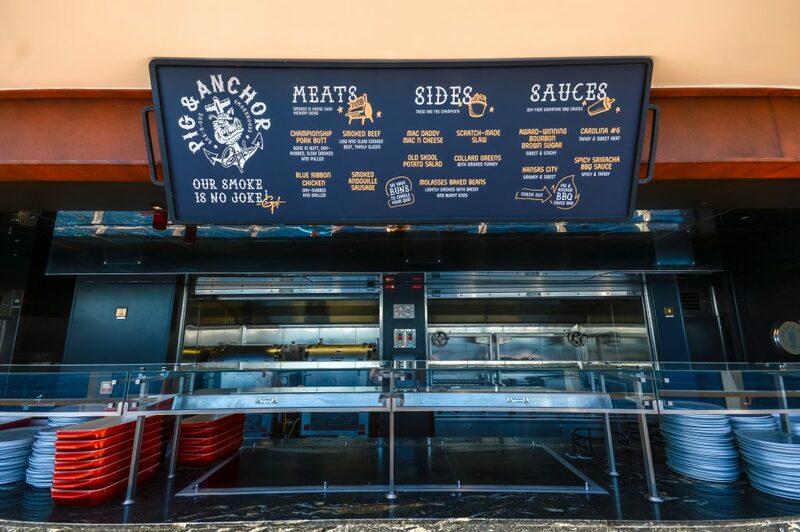 From 12:00 to 14:30 there was a delicious and free BBQ lunch offer from the Guy’s Pig & Anchor Smokehouse on deck 5 in the outdoor area. Similar to a buffet, you can tell the staff behind the counter everything you want to eat. 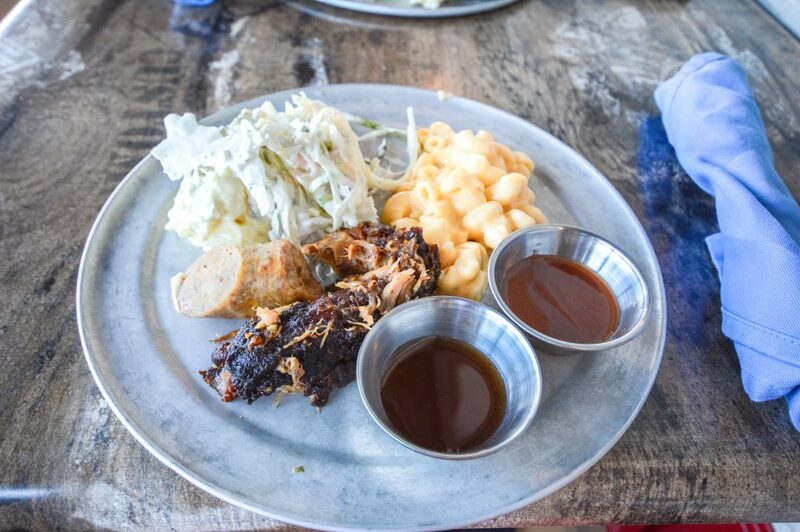 Besides sausages, pulled pork and other delicacies, there are also Mac’n’Cheese and Coleslaw. 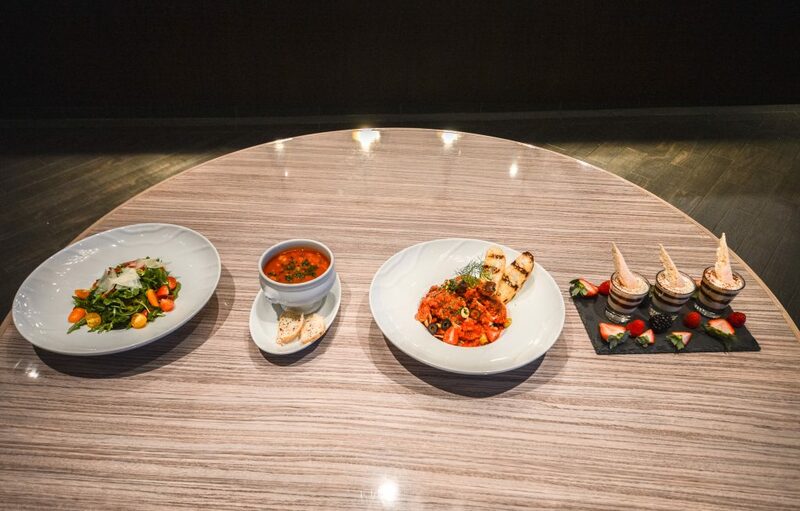 At a bar table you can choose between different sauces. Outside there are many chairs and tables in an American diner style, both in the shade and in the sun. 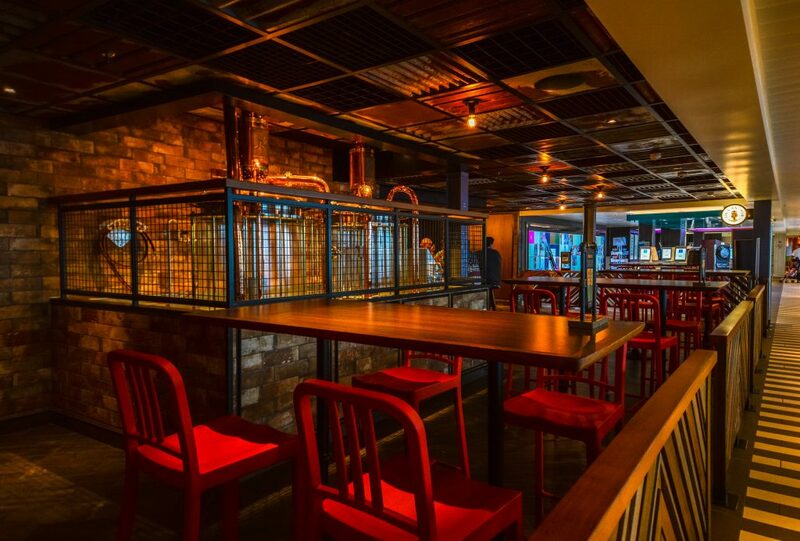 The Smokehouse also offers a Craft Beer tasting for only 5.75 US dollars. The so-called Hog Sampler contains four different Craft Beers, including an Amber, Ale, IPA and a Porter Craft Beer. We also had a pumpkin beer as the Halloween celebrations were approaching. 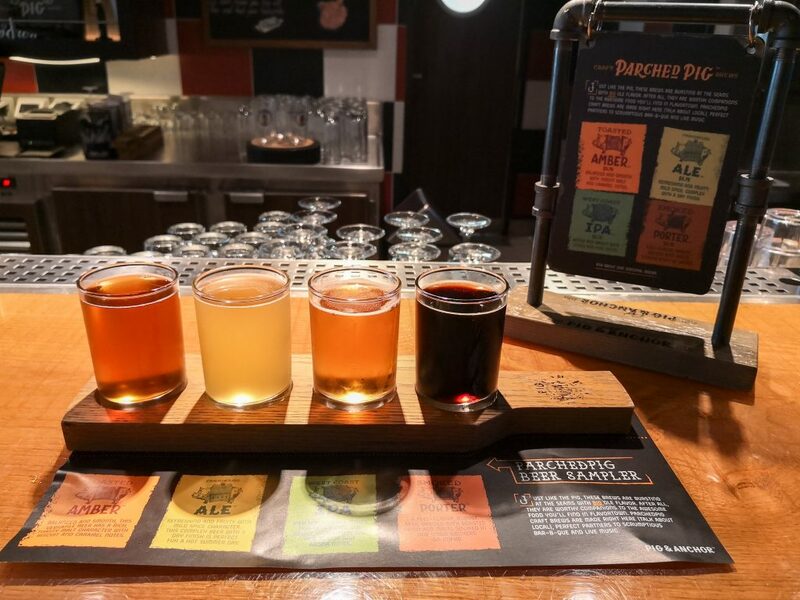 The different beers are served on a wooden board with a laminated sheet explaining the different types of beer. The beer tasting is especially fun in the evening when live music is played. On deck 5 you can walk around the whole cruise ship. In front at the bow you can go two decks higher to enjoy the view from the bow. Beside wooden benches there are also some deck chairs to relax. 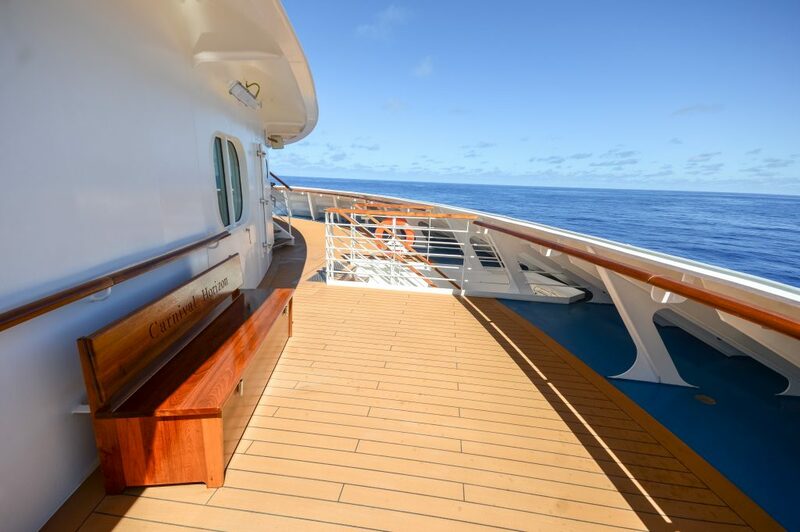 On sea days you can always find a quiet place at the bow. 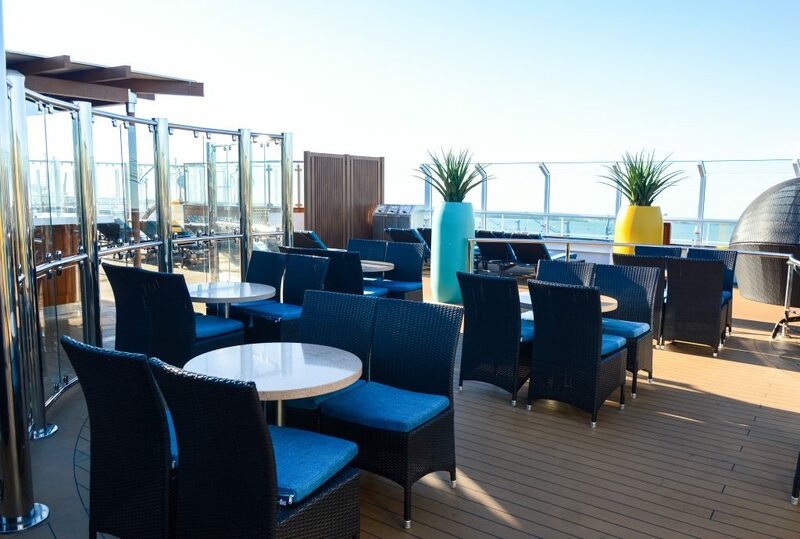 On sea days in the afternoon they offer a tea time on deck 4 in the Meridian Restaurant. 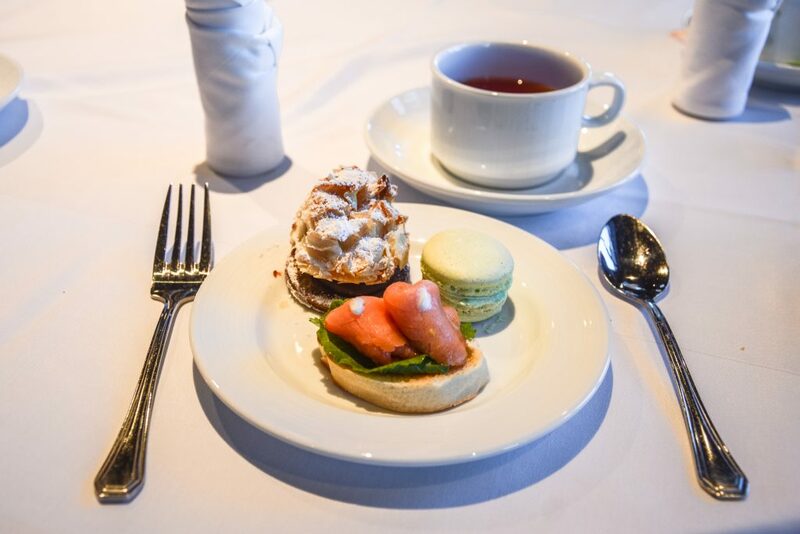 From 3 pm to 4 pm you can enjoy some sandwiches with salmon or cucumber, cakes, macarons, biscuits or classic scones with marmalade at beautifully set tables. A cup of black or green tea is also served. There is also a table reserved only for the veterans on board. You are placed at the tables by the waiter and can therefore also be put together with a funny round of strangers. 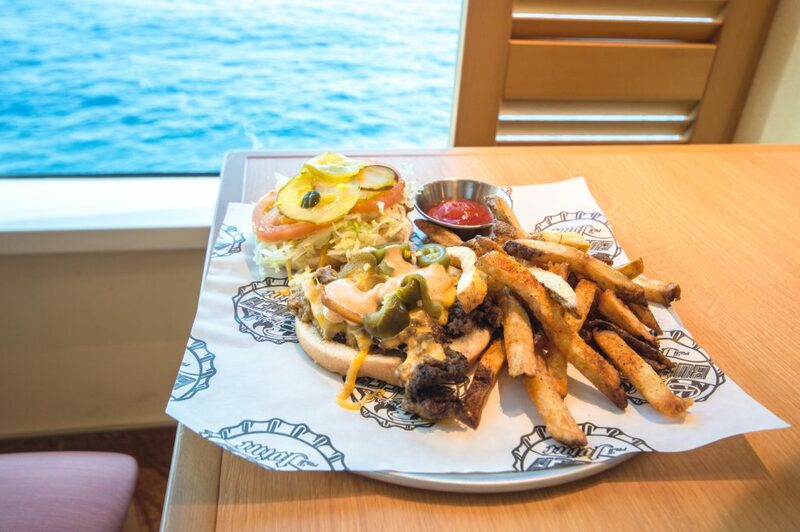 On the lidodeck (deck 10) there is the Blue Iguana Catina with delicious burritos and the Guy’s Burger Joint with delicious burgers. 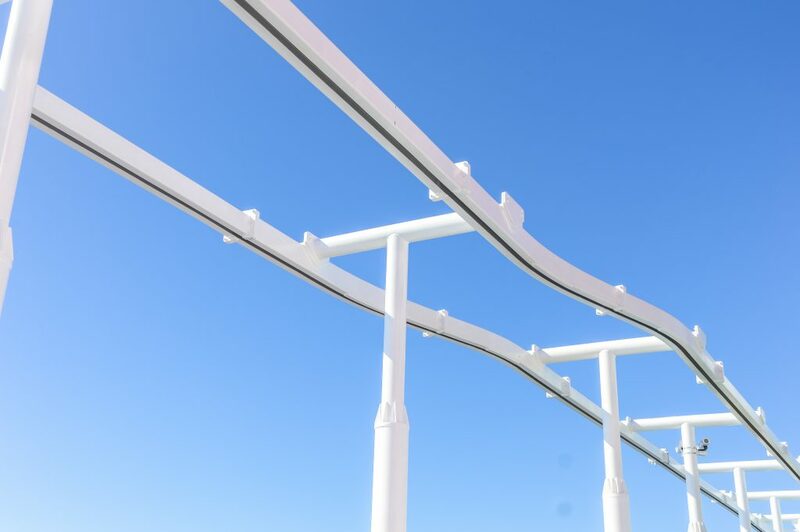 Both are located right by the pool. 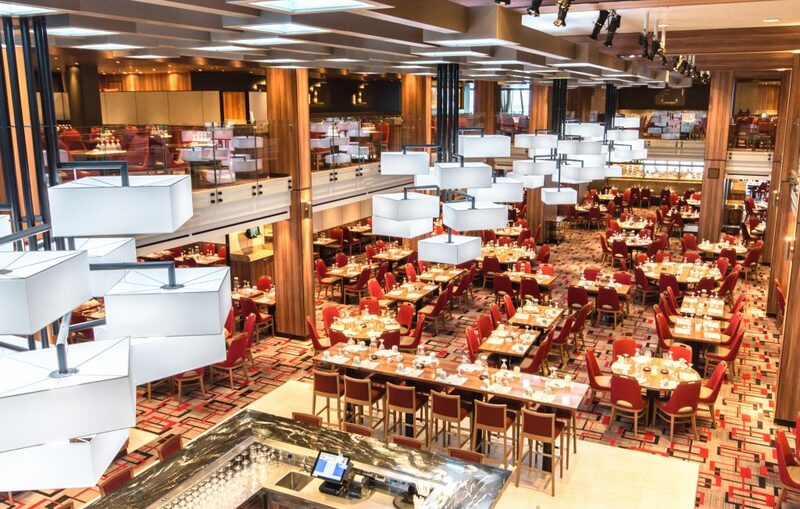 You can also enjoy your meal inside in the adjacent buffet restaurant in a quieter atmosphere. In the Guy’s Burger Joint you queue up to choose the burger. There are also fries. Afterwards, one can choose diverse toppings at the toppingsbar. You can choose between jalapeños, bacon, tomatoes, salad, pickled cucumbers, roasted onions, extra cheese and different sauces. 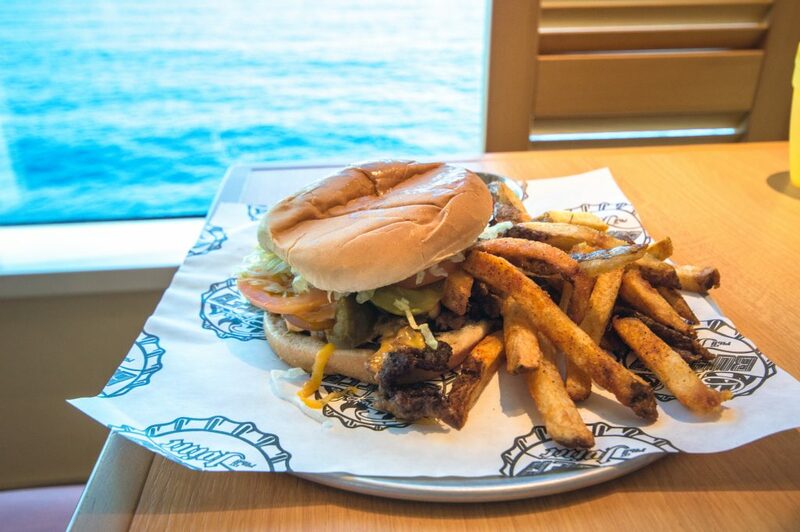 From 12 am to 6 pm you can enjoy freshly made burgers with a view of the sea every day. 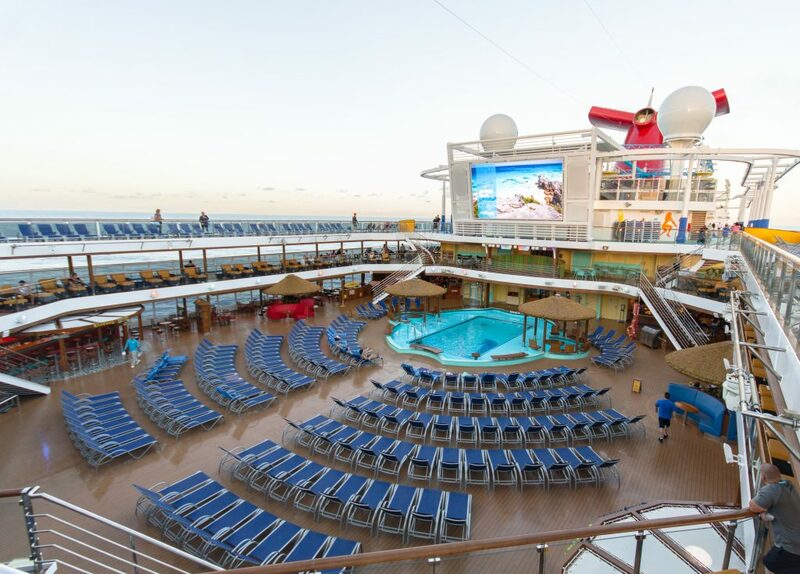 Every day, the lidodeck around the pool becomes an open-air cinema. Two to three times a day a full-length film is shown here. We loved the movies in the evening at 7 or 10 pm, which can be watched on the deck chairs in front of the huge screen above the pool. With a borrowed blanket, one can also make oneself really cuddly in cooler nights. In addition, there is salty popcorn that you can get for free at the Rum Bar. 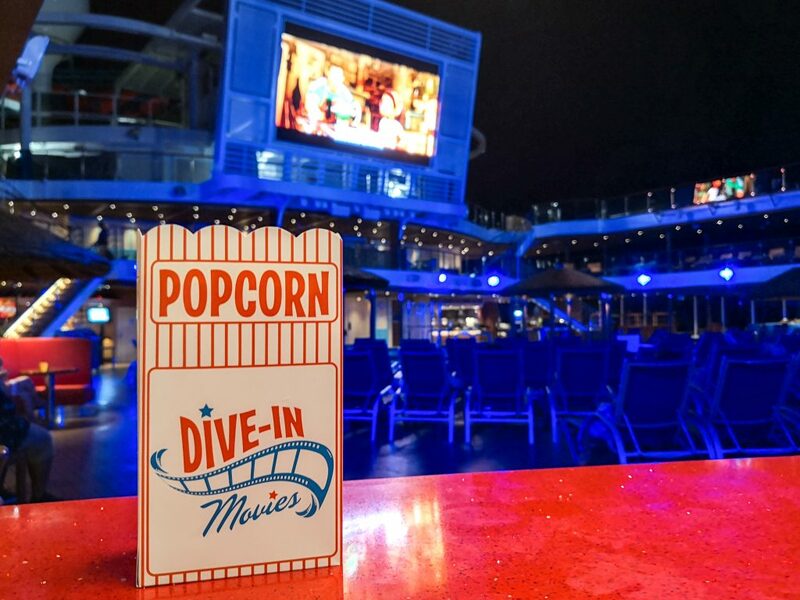 With popcorn and blanket, watching the movie becomes a very special experience aboard the cruise ship. There is a daily changing film offer, so one day action films were shown, the next day animation films and on Halloween even horror films. The air is pleasantly fresh on the open deck, unlike on some ships, where the smell of chlorine is a major disturbance to the film experience. In addition, the atmosphere is wonderful, because the guests all try to rest during the film. 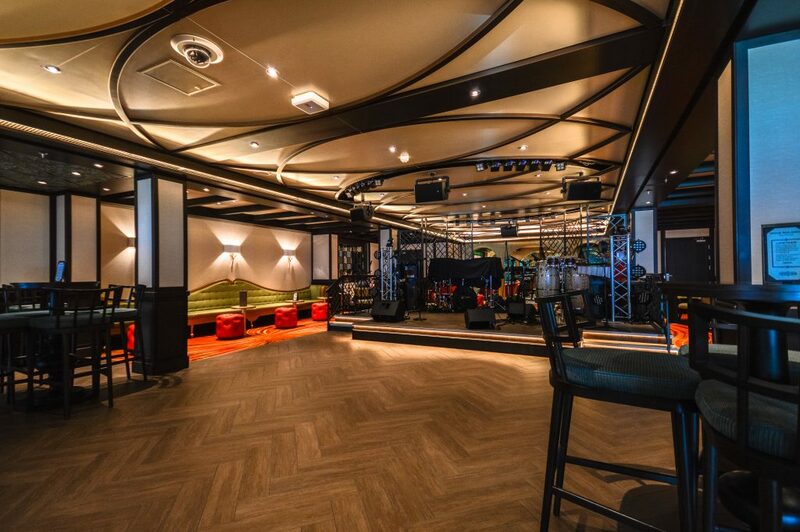 The Theater Liquid Lounge extends across decks 4 and 5 at the bow of the ship. In the evening there are two show times at 19:30 and 21:30 either a great musical, a show with acrobatics, a comedy show or a funny interactive show with guests on stage. 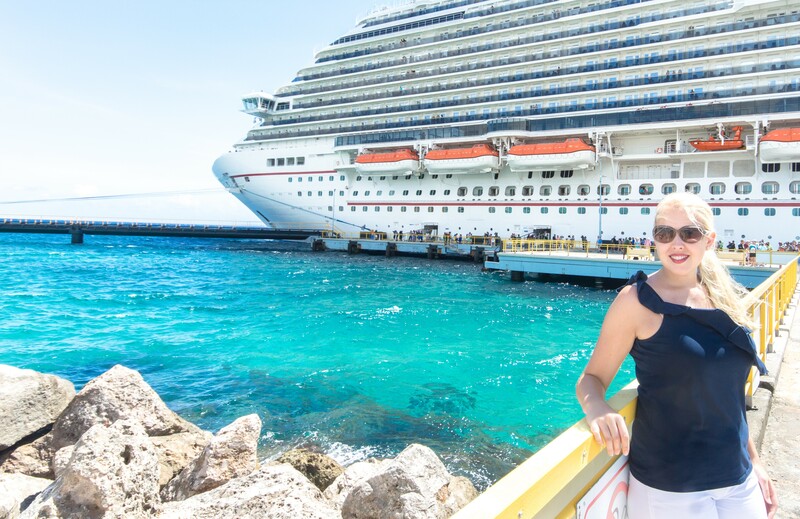 The fun factor is particularly high at the Love & Marriage Show with Mike, the cruise director. At this show, three couples are invited on stage to play the famous question and answer match game known from weddings. On our trip there was an older couple who had been married for over 60 years, a couple with 20 years of marriage and a newlyweds couple. The results were very entertaining. The Love & Marriage Show, however, is only from the age of 18. The comedy show on the last evening was also very good. 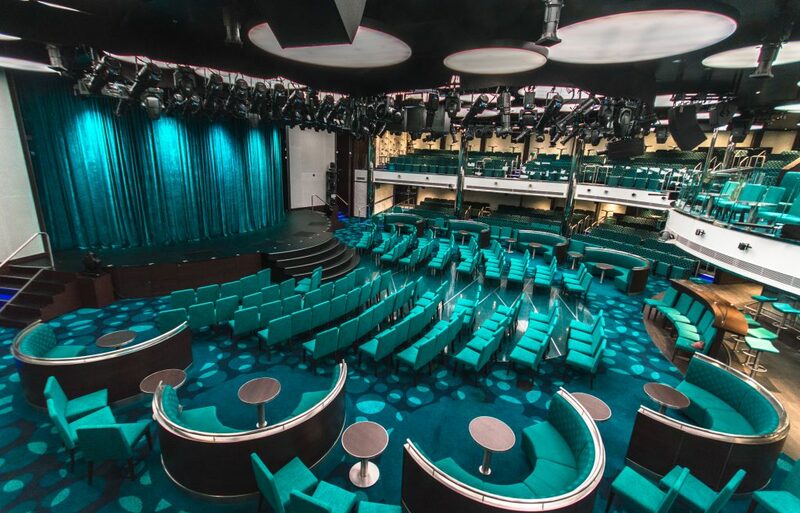 Normally the comedy shows are presented in the Limelight Lounge, but on the last day at sea two comedy actors presented a show in the Liquid Lounge. But to understand the jokes, you should be relatively fluent in English. 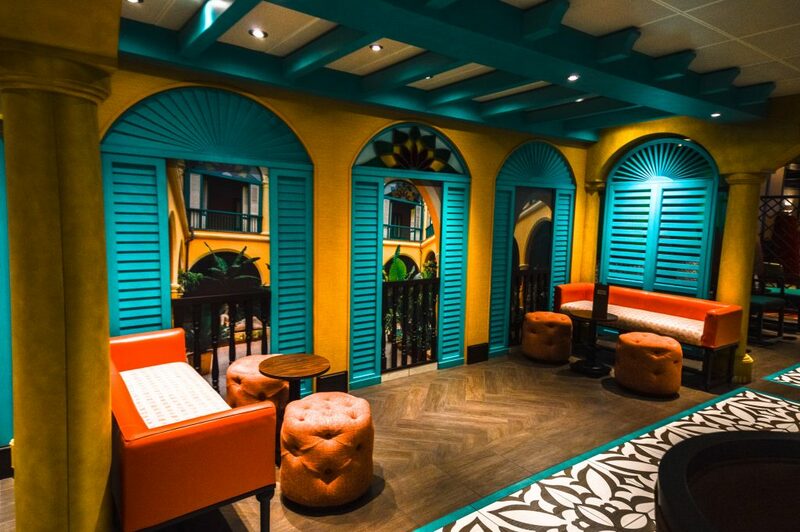 To round off the evening, you can drink a delicious cocktail in a great dance atmosphere in the Havana Bar. 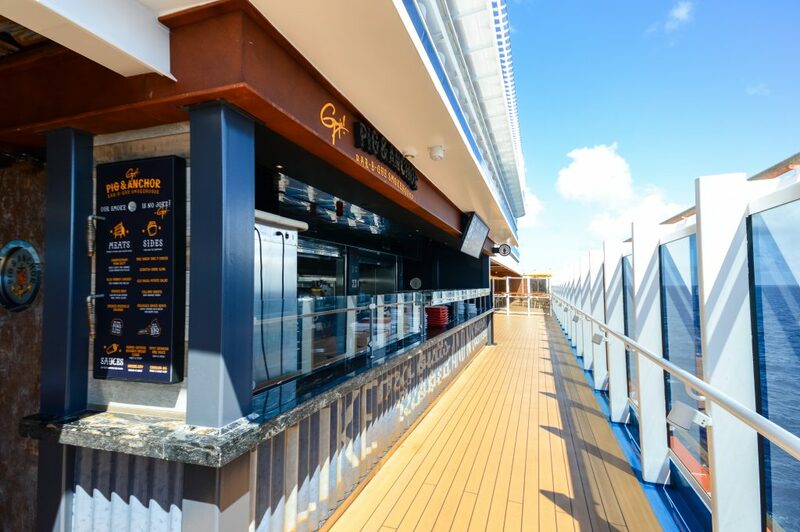 The bar is located on deck 5 at the stern of the ship. From 7:30 pm you can listen to the Latin American songs, which are sometimes played by a live band, and swing your dancing leg. 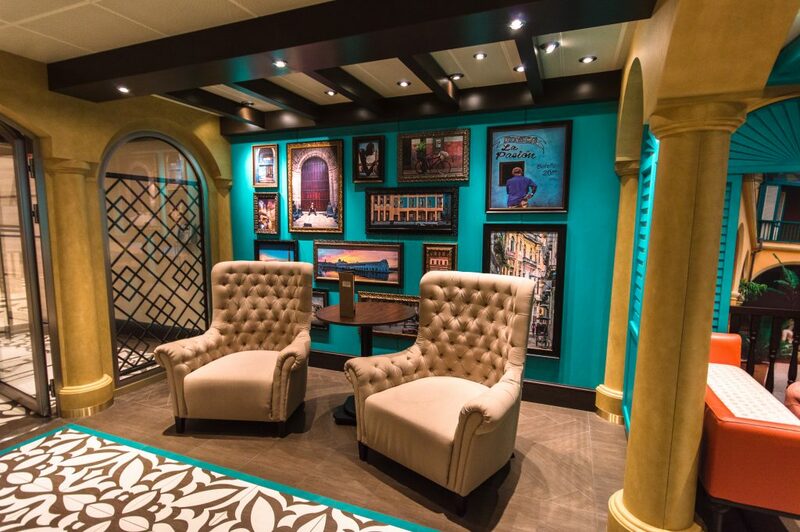 Here it smells of cigars and rum cocktails and the bar has a very special charm. 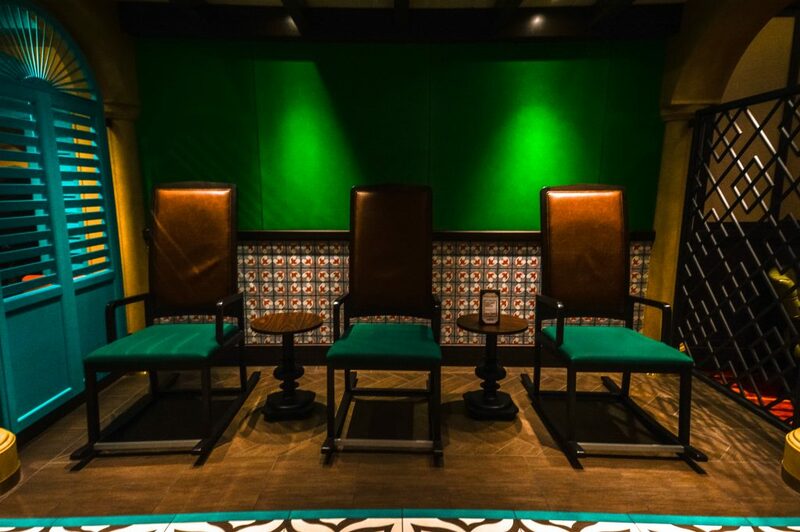 Already in the entrance you can see different armchairs in front of turquoise blue walls with a lot of decoration and some tables to smoke cigars.